There are two versions of this multifunction device: the Pro 8600 and the Pro 8600 Plus. They differ the claimed print speed (in the 8600 Plus it is higher, even though the technical stuffing de jure is just the same), the body design (the difference is insignificant), the diagonal LCD touch screen (the 8600 Plus features a larger one), and, of course, the price. Both multifunction devices continue a famous series of HP Officejet Pro, intended for small and medium-sized businesses. 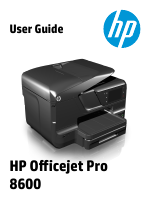 The catalog of models on the HP official website has placed the Officejet Pro 8600 in the section of "More flexibility for growing businesses." As for flexibility, the Hewlett-Packard means abundance of added functionality, and above all - capabilities of a stand-alone operation. You can print directly from USB-drives (flash drives or external hard drives), memory cards, mobile devices, and even from the Internet. The latter is now in vogue and HP focused its "cloud" capabilities, calling the device not "4 in 1" but "5 in 1". «Print, Scan, Copy, Fax, Web» - such an inscription decorates the front side of the body. The Web implies support of the proprietary HP ePrint. This is printing by e-mail. The Internet connected device is asiigned a unique e-mail address to which you can send your e-mails with attached documents. These documents will be printed immediately. Of course, such a scheme comprises a certain degree of danger: the phrase "piled spam" can gain in this case its literal meaning. However, the manufacturer has provided the anti-spam protection. But as it often happens some harmless letters can get under repressions. The Pro 8600 is an example of a rather bold, but tidy office design. Lots of modules in one package and everything is organic and stylish. HP managed to combine not so austere beauty with exceptional practicality, wherein, nothing is sacrificed. Noble matte coating prevails, plastic is high quality and pleasant by touch. The body lines are accentuated with glossy inserts, but that does not affect the practicality, minimum mirror surfaces. The Pro 8600 is controlled with the help of a pivoting panel with a color LCD screen (diagonal is 4.3 inches). The LCD touchscreen enables quick access to four modes of the device (copy, print, scan and fax). The screen menu is organized quite well and provides great opportunities. It is not surprising, since the All-In-One 8600 implies an autonomous operation. All is modern and high-tech. From the "analogs" there is only one button, namely power on/off, which is in the lower right corner of the front panel. Printer trays are concentrated at the bottom, one above the other, both are horizontal. The input tray for 250 sheets of plain office paper. The output tray is telescopic with the capacity of 150 sheets. As an option, the installation of an additional 250-sheet input tray is envisaged. The ADF (automatic document feeder) provides for two-sided copying, printing, or scanning of 50 sheets. The scanner cover has no intermediate locking positions, it is held only being lifted up to the stop (over 90 degrees). On the back side of the body there is a place for a removable duplex and connectors (all located on the right): power, USB, Ethernet, and two telephone ones. So the exterior of the All-in-One HP Officejet Pro 8600 makes an impression of total reasonableness. Not a single superfluous line, no negligence, even the rear connectors, built into the body are carefully and exclusively framed with a decorative border. And all this beauty, which is important, is not to the detriment of practicality and ease of use. Here it is necessary to pay tribute to the professionals from Hewlett-Packard. Cartridges of the printing part of the Pro 8600 do not constitute a separate fixed unit, but separately they are installed on the carriage. Such an approach imposes severe limitations on the total weight of inkpots, and hence their resource. The heavier the carriage, the more difficult to position the print head and the greater the vibration of the body will be caused due to the rapid movement of the carriage from side to side, which to a great extent defines high speed printing. The maximum resolution of monochrome printing is 1200x600 dpi, of the color printing is 4800x1200dpi. The quality of black-and-white document printing is decent. The quality of photo printing is not so good with grain and rough tone transitions. While taking into account that the Officejet Pro 8600 is an office machine the photo quality can be called acceptable. On the whole, the HP Officejet Pro 8600 is just a great solution for offices of medium sizes, which features decent printing speed, quite acceptable printing quality, the ability to withstand heavy loads, office modules (duplex ADF, fax), large trays, the broadest possible autonomy, an impressive set of interfaces, and practical design.